Stellar Wind‘s résumé leading up to her 5-year-old season was already, well, stellar. She earned a championship, defeated four-time champion Beholder twice, and won six graded stakes overall—but she added a line to her accomplishments April 14 at Oaklawn Park. 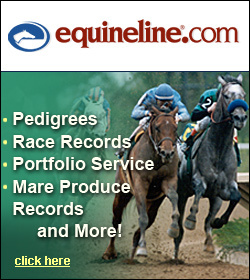 Since joining trainer John Sadler after breaking her maiden at Laurel Park during her 2-year-old year, Hronis Racing’s daughter of Curlin has won all of her races at home on Southern California soil. But in the $600,000 Apple Blossom Handicap (G1) Friday, Stellar Wind shipped out of town and won for the first time. Her two previous stakes starts outside of California—albeit with troubled trips on the racetrack—resulted in a fourth-place finish in the Longines Kentucky Oaks (G1) and a neck second in the Longines Breeders’ Cup Distaff (G1), both in 2015. 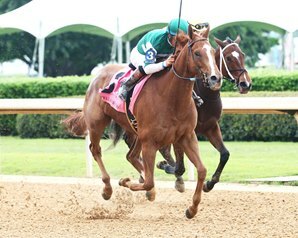 Stellar Wind won her ’17 debut with a victory in Oaklawn’s $600,000 Grade I Apple Blossom. Picture courtesy of Coady Photography. Stellar Wind is shown in the Oaklawn backstretch days before the Apple Blossom. Picture courtesy of Coady Photography. Terra Promessa, another daughter of Curlin, cruised easily on the lead early and set fractions of :23.88, :48.22, and 1:12.59 through six furlongs. Fourth entering the first turn, Stellar Wind improved her position on the rail to move into a tracking position in third on the backstretch, moved ahead of Durango, and engaged Terra Promessa in the final bend. Although Terra Promessa momentarily appeared to be game for a stretch duel, she was no match for Stellar Wind late, as the 2-5 favorite put a head in front with a furlong to run and cruised to the wire as Espinoza only showed the mare the whip. Streamline, who won the Azeri (G2) last-time out over Terra Promessa, came in 3 1/4 lengths back in third, followed by Tiger Moth, Divine Elegance, and Durango, to complete the order of finish. 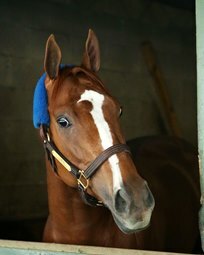 With her eighth win from 13 starts, Stellar Wind, who was bred in Virginia by Keswick Stables and Stonestreet Thoroughbred Holdings, now has more than $1.8 million in earnings. Sadler said after the race that a start in the June 3 Beholder Mile (G1) back home at Santa Anita Park could be next for the mare.